Another day, another birthday. Hey wait a second – how did my previous “baby” get to be FIFTEEN? If this keeps up, I’m going to have to go to bed, because I feel old. Edit: here’s a pic of them before htey went out last night. 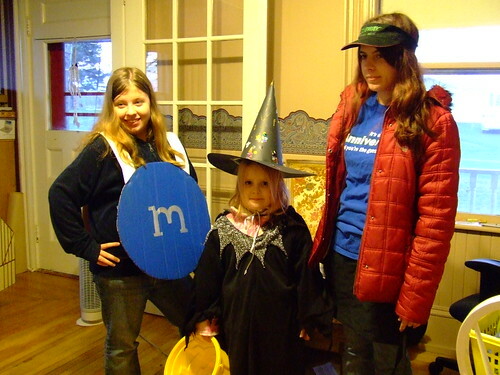 Meaghan made an M&M costume that morning. I finally finished the re-working of this quilt. 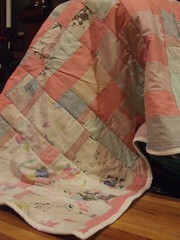 I got the quilting bug somewhere in the mid-90s when my bigger kids were small. Meaghan was a toddler, if not a barely walking baby. I had already started a quilt for Sarah (handquilted, still unfinished) and decided that Meaghan needed a quilt too. Besides, she kept running off with the softest or cutest fabrics, stuffing them in her crib. I originally whipped this up in a few days, possibly as little as three. No pattern, I just had dozens of strips of fabrics someone had given me. They had got them from a bedding manufacturer as waste and ordered it by the garbage bag full. I just grabbed from my stash, whizzing the strips through my then-new serger, cutting the larger sewn strips into blocks, rearranging and sewing back together until it was big enough. Some pieces of fabric leftover from small dresses and pajamays made their way in. I had originally layered it with regular poly quilt bat, and sewn together two large pieces of bright clown fabric sheeting (I’d never use it for anything else) for the back. I quickly tied the layers together with pink embroidery floss. I did a fast and loose job of binding, cutting the back bigger , and folding the edges around to the front and quickly stitching them down. My grandmother, who taught me how to sew and quilt, pronounced it "passable". Five years ago, when we moved here, I noticed that the seams were coming undone on the front, the back was worn, the stuffing loose where it wasn’t bunched and the hastily folded corners poking out and dragging everywhere. After many years of being loved to death by a little girl, and many trips through the washer, it was showing its age. I sent it of to a lady who would machine quilt anything you gave her, for $25 and up. My mom said she’d finish binding it, then she never got round to it and niether did I. "My quilt!" Meaghan squealed when I dug it out. I’d just finished overhauling my long-unused sewing machine and was itching to get back behind the pedal. Meaghan sat across the table from me as I worked. This time, I did a more careful job, one that was now backed by years of experience. It only took twenty minutes or so. I remembered when she was so little she barely spoke, but she grinned so wide wrapped up in her quilt, lost in its folds. After removing all the pins that had stuck in it far too long, I picked it up and draped it round her shoulders. It barely covers her now. "Here you go, baby." I hugged it round her best I could. "Thank you, Mommy." She smiled. It still keeps her warm. It’s a fine day for me when one of my kids finally “get it”. Meaghan talks here about cleaning and sorting, and WWMD(what would mom do). I remembered I totally forgot to tell you then ends of a few story threads. I wanted to write good articulate entries about each one, but… eh. – Sarah didn’t get the job at the CD store. It was a good experience all around though. The manager was impressed with her, and it was down to her and TWO other people. He oversees all of that chain’s stores in the Maritimes (around a dozen at least). She’s still getting plenty of hours at Subway, and they are mondo impressed with her. Also, she has managed her money quite well. The only splurge has been a 30Gig mp3 player, and if you’ve seen the amount of CDs she has, you’d know that was a good idea. – After Ron helped Addison move, our van almost died. There’s no way it’s gonna make a long trip like that again. I can still run around town with it, which is good. – Meaghan has been baking up a storm. Pumpkin pie, homemade pastry of course, cherry coffee cake, cheesecake (baked) and various appetizers. Too bad nobody is here to eat it. She’s also discovered the joy of reading the dictionary. – Just today, we finished the bathroom. I still have some touch-up painting (it never seems to end) but we have reached the point we can put away tools. The point at which we can call a realtor to come over is in sight. In the distance, but in sight. Fall pics are coming, I promise. I was going to put them in our gallery, rather than up at Flickr, as there is a LOT, but my ftp program is being funky.